Welcome to the Lakes Need Water newsletter July edition. LakesNeedWater has been invited as a group to provide comment on the latest Murray Futures report. Click here for the information from DEH to review as well as instructions. Please send us your comments by August 5th. Our deadline to the DEH is August 7th and we'll need time to compile the results. The Supplementary EIS for the Pomanda Weir is on Peter Garrett's desk. He has until mid August for a decision. Please email Mr. Garrett with your views. According to the EIS summary: A minority supported the temporary weir and some indicated a preference for seawater flooding of the Lower Lakes (rather than a limited incursion). See our Act Now page for details. Hot off the press. 891 ABC radio is planning a visit to Clayton/Goolwa the week of 27 July. It would be great to have some balance to the media. Tune in and if possible get a word in or send 891 an email during the broadcast. 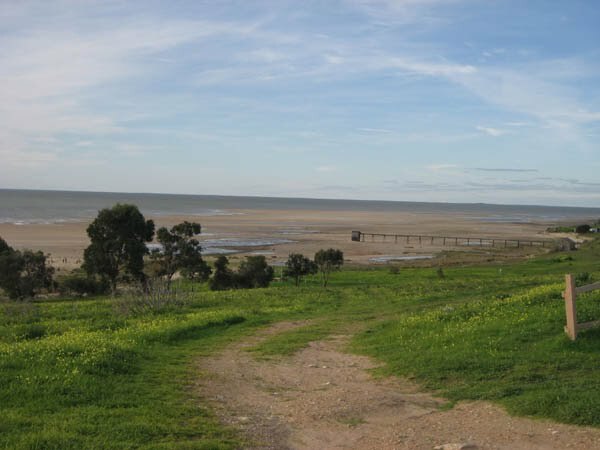 "Although the northern reaches near the Murray Mouth may not exceed marine salinities, this region no longer experiences the lower estuarine salinities that were more typical prior to the cessation of environmental flows. Essentially there is no longer an estuary". As media articles of importance come up we are updating our Latest News page. Please check regularly for pertinent articles and we encourage you all to make comments to the news articles. Better yet, make www.LakesNeedWater.org your home page. We'd like to encourage all of you to write to politicians. Also to comment on news report blogs, radio call in's, etc. It's important to try and balance what seems to be a freshwater bias in the media and get everyone to speak out about "the other option". We welcome more letters or articles for the website. If you would like to send us your letters and photos, we need them and welcome your input! Raukkan (July 2009) by Sean Murphy.